Good news to every Juan and Juana of this generation! MediCard, a leading health maintenance organization (HMO) provider, gives a time-saving and convenient option to get medical consultations anytime, anywhere with the My Pocket Doctor. “My Pocket Doctor is definitely a game changer especially in the medical field. It is also our way of using modernized technology to make medical consultations handy for everyone. With less waiting time, patients can now get in touch easily with a medical doctor and get consultations instantly, at the comfort of their homes or offices,” according to Dr. Nicky Montoya, president of MediCard Philippines. This is very ideal setting for those who are busy and for those who are shy and most especially those people that can't barely bare the temperature outside because of the high heat index. How to use My Pocket Doctor? It is easy peasy to use! Just simply register on the My Pocket Doctor website (mypocketdoctor.com) or via the app through the App Store or Google Play Store and wait for an activation link with username and password. Users can also register via text by sending their email address and cellphone number to 29290DOCTOR (or 2929036-2867) and wait for a call from a nurse to complete their one-time registration. 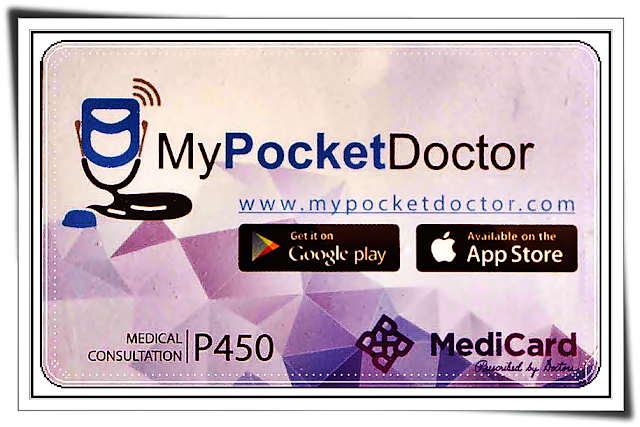 The MediCard My Pocket Doctor Card is for sale for only Php450 at select MediCard free-standing clinics. Soon, the card will be also sold online through MediCard’s online store. So what are you waiting for? Go and buy yourself and your loved ones a #MediCard #PocketDoctor now. *Actual card may vary from the photo above.